Our German Shepherd Aura hanging out in her Crate. The best dog crate for a German Shepherd Dog is just large enough for them to stand in, turn around in, comfortably lie down in and normally 42 – 28 inches long. Many wire crates come with adjustable dividers which will grow with your German Shepherd. Buy this crate on Amazon here. 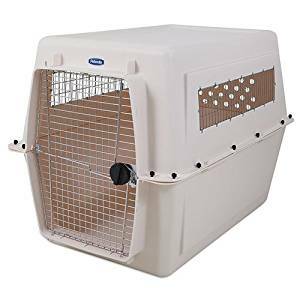 At $65.99, this is the cheapest dog crate you are going to find for your German Shepherd and is sold by Amazon with Prime Shipping. I have one of these and really like it a lot. My girl’s crate is 42″ and I have used 48″ crates on larger male Shepherds. The 42″ is only $66 delivered. You just can’t beat the price. Many sizes available. The 42″ model is 42x28x30″. The 48″ model is 48x30x32″. Paw protector. This is basically a plastic pan which sits in the bottom of the crate. Choose single or double door version. Folds down flat for easy storage or transportation. Available in 30″ puppy size for only $33! Buy this crate on Amazon here. If you do not want a wire crate, this is the crate for you. This is the kennel my German Shepherd Aura uses and she flew here from Germany in it via United Airlines. 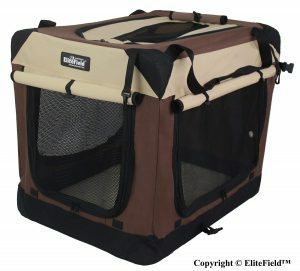 This is a giant dog crate and ideal for travel as it has tie down holes. If you plan on using this crate for airplane travel, you will just need the water bowl for it which is sold as an option. It’s almost $300 but is practically indestructible. This crate comes in a wide variety of colors, but this is our favorite since it looks like a German Shepherd! At 42″ long x 28″ wide x 32″ high, it is one of the largest soft crates out there. 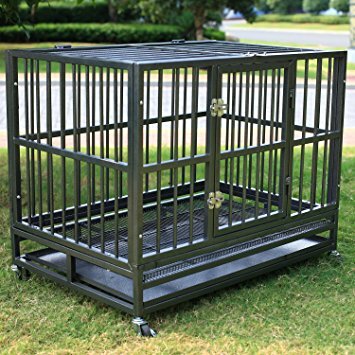 You can buy this crate on Amazon for under $100 here. Soft crates are basically good for “well behaved” German Shepherd Dogs who do well in crates. If you have a digger, this is probably not the crate for you. Buy this crate on Amazon here. This $200-ish crate is significantly stronger than other “wire crates” on the market but it is by no means bullet proof. While this would be fine for most people and dogs, if you have a dog who really wants to get free they may not escape but they could bend wires. This crate has wheels, a tray, double doors and features a fairly thick, steel frame. Be aware that this crate is 90lbs. A good friend of mine has this and it works out well for him, but according to some Amazon reviews people had to do a little extra work to their unit to ensure paws didn’t get stuck. After shipping this crate is generally around $925. This is the last crate you will ever buy and even comes with an escape guarantee. If you’re trying to keep a dog locked up who likes to escape, look no further. Assembly is required for this crate, but once built you have one of the sturdiest crates available which could keep Houdini hostage. 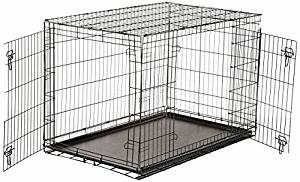 What is the best size crate for a German Shepherd? Most people who get their German Shepherds a crate opt for a 42″ or a 48″. If you will be gone for 8-10 hours a day at work, a larger kennel system is a good idea. My girl Aura loves her crate which is like a little den for her. I leave the door open and she goes in it often when she wants to get away from it all. She has the 48x32x35 Petmate Ultra Vari listed above. I work from home and she is rarely locked up in it. 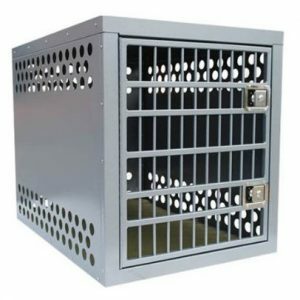 What is the best material for a German Shepherd crate? “Escape artist” dogs may need the Sliverlake or Zinger Winger kennel listed above. The sliverylake is steel and the Zinger Winger is heavy duty aluminum. The aluminum crate is lighter weight. My girl Aura uses the Petmate crate which is plastic. This kennel breaks down into two pieces. Don’t tell her but the kennel is not bolted together and hasn’t been for years! If she just pressed her back against it it would fall right apart and she would be free. But she is free to roam the house even when we’re not home most of the time. Which crate is best for travel? I have a truck and the Petmate crate travels easily for me. I just break it down into two pieces which sit inside of eachother and throw them in the bed of the truck and off I go. Before that I used a folding metal crate. The cheap one at the top of this is an excellent choice, however, before you order it you should check out your trunk and make sure you have 48″ to spare. Our other car is an SUV with plenty of room although this will not fit into the trunk of a Honda Accord. I did, however, used to have a 42″ model which did fit into my trunk and I did indeed have an Accord. Crates should always be a happy and safe place for your dog. Never use the crate as a punishment. 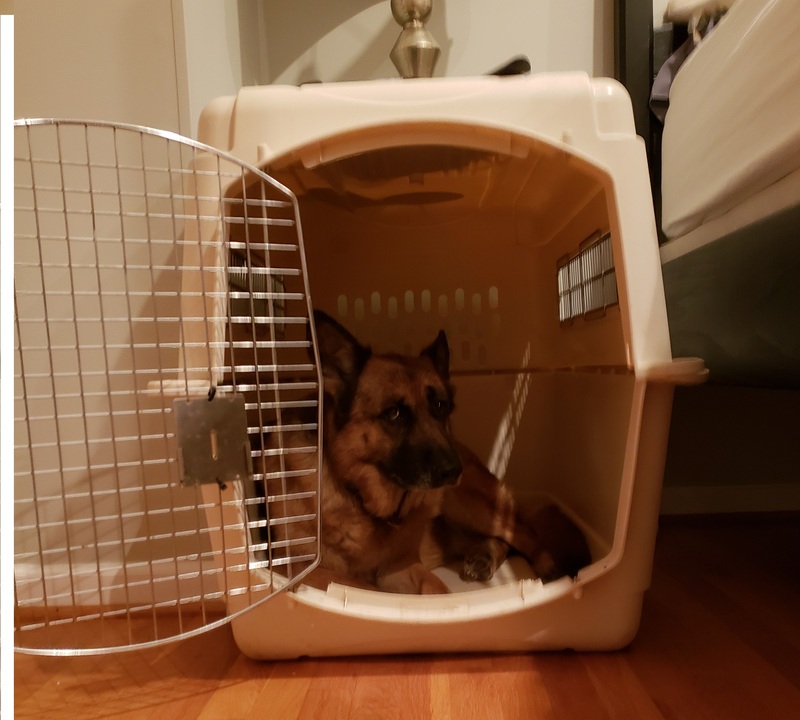 When I had puppies, they would fight over who got to use the crate and these days my 8 year old German Shepherd goes in and out of her crate several times per week whenever she feels like it. Crates are also amazing tool for potty training puppies.